Comet 209706A. 1-1/8" Bore Comet Industries 44 Magnum Series Drive Clutch. 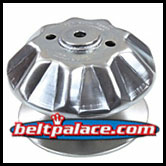 Home > Comet Clutches and Parts > Comet 203039A - Green Compression Spring for 40/44 Series Comet Industries Drive Clutch. > Comet 209855A. RED 3/4" Pucks. Set of 3. Comet 44 Magnum Series Drive Clutch. > Comet 209406A. 3-Pack of “White” Solid Puck Kit > Comet 209706A. Comet Industries 44 Magnum Series Drive Clutch. 1-1/8" Bore. ONLY FOUR LEFT IN STOCK: LIMITED TIME SALE! 209706A fits select golf carts with 20HP conversion. Requires Comet CVT Belts, 7/8” Top Width. Replacement 209855A 3/4”- RED puck kit (stock). Replacement 203039A “Green” compression spring (stock). Replacement 211573A “White” Garter spring (stock). 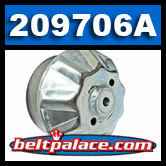 Use with Comet Industries 40/44 Series Driven torque converters or those requiring 7/8"-15/16" Wide belts.